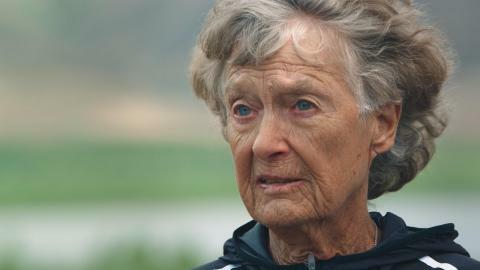 NIKE, Inc. (NYSE:NKE) today unveiled a new film that captures how an unlimited mindset can be the key to breaking through limits, while staying forever young. “Unlimited Youth” celebrates an extraordinary athlete, Sister Madonna Buder, and her determination to defy conventional conceptions of age. It is the latest installment in Nike’s “Just Do It – Nike Unlimited Campaign,” which hails both the everyday athlete and the champion athletes who regularly push beyond the unimaginable. “Unlimited Youth” follows “Unlimited Future,” “Unlimited You,” “Unlimited Courage” and “Unlimited Together” as part of a campaign that has already struck a chord with millions of consumers around the world, amassing over 275 million global views across multiple platforms to date. The company also profiles a number of its premier athletes including Gabby Douglas, Simone Biles, Ashton Eaton and Allyson Felix, here, detailing in-depth the resolve that victory requires. The films are just one component of Nike’s global campaign celebrating athletes around the world across an amazing year of sport. Consumer activations are taking place in Los Angeles, London, New York, Paris, Rio, São Paulo, Shanghai and Tokyo, with the Nike Unlimited Cross-Category footwear collection available at retail across the globe. NIKE, Inc., based near Beaverton, Oregon, is the world's leading designer, marketer and distributor of authentic athletic footwear, apparel, equipment and accessories for a wide variety of sports and fitness activities. Wholly owned NIKE, Inc. subsidiaries include Converse Inc., which designs, markets and distributes athletic lifestyle footwear, apparel and accessories; and Hurley International LLC, which designs, markets and distributes surf and youth lifestyle footwear, apparel and accessories. For more information, Nike’s earnings releases and other financial information are available at http://investors.nike.com. Individuals can also visit http://news.nike.com/ and follow @Nike.